I noticed that several people is complaining about the half sloper antennas performance and the results are completely different from different users. I have the sloper for several years. I tested several versions including the big loading coil at the feed point (avoid it) as same as trapped slopers and many others. There are some things that you should know about using any half sloper including the commercial ones. 1. 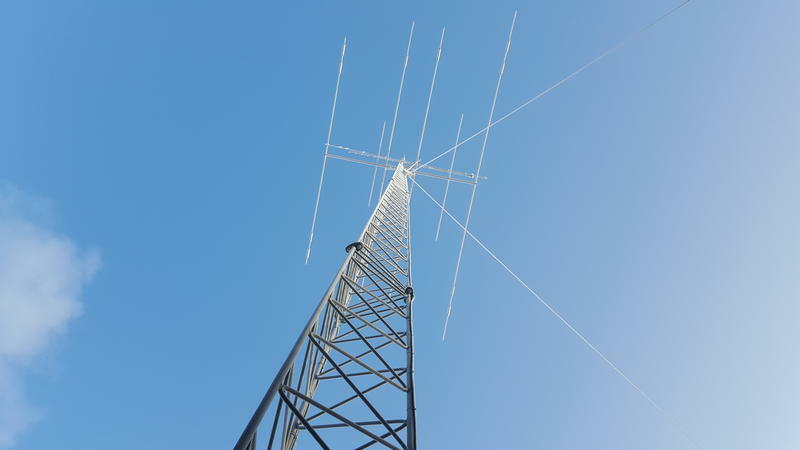 Regardless of what manufacturers claims any half sloper is most effective when it is mounted on a tower/mast at the 30 - 60 foot level (35ft works well for me) and the tower or mast has a large tribander or VHF antennas (at least) on it. This gives the system some top loading. 2. Mounting it on a pole with a lead to ground is not going to get it done and it is definitely not enough to get good performance. I have tried this on occasion and the performance is degraded considerably. Same as mounting it on a tree or on the side of a house even although I will install the grounding wire down to the radial system. You will be able to make contacts, but a low dipole or loop will almost always make similar job or even will out perform a half sloper set up this way. 3. These antennas are primarily vertical radiators and do a decent job on DX at 40/80/160 meters in case of proper installation. 4. In any kind of shortened slopers (to get total length of about 15-20m) using big coils the SWR points are about 10-15kHz either side of resonance because it is shortend for that band a lot. My full quarter wave 160 half sloper during short test had about 60% more bandwidth then these shortened ones. 5. The addition of a radial set tied to the tower/mast seems to make a positive difference. I did some testing over the air using 16pcs of 1/16 wl radials and without and most stations report that there was more punch to the signal when using a radial system although it did not always show up on the S-meter. Performance without a radial system is usable however. If these antennas are set up correctly either the commercial ones or a simple quarter wave wire set up as a half sloper will work fine.